The Canadian flags in red and white colors are on both sides of the stein. Canadian wildlife are depicted above and below each flag in an etch-white design: moose, Canada geese, wolf, salmon and polar bear. 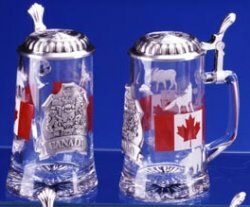 In the center of the stein is an embossed pewter appliqué featuring the Canadian coat of arms above a CANADA banner. The embossed pewter lid features a maple leaf and the word CANADA.